Wife to an amazing man, loving step mother, pet mama to the wonderful Nevada and fabulous friend to many and the creative soul behind Totallyawake4-life! A creative soul at heart I am an educator, artist, and love being a mentor to many ... a hoarder of information and knowledge everyone is always telling me I should start a blog ~ so here I am starting a blog to share with you all the things that bring joy and love to my life! I think I was born a natural nurturer ~ I can remember being ‘wee’ taking care of all my stuffed animals, talking to them about their dreams, lining them up and playing ‘school’ with them. It filled a need in me to help others to be the best they can be, to encourage, to coach and to help them reflect so that they could have a peaceful happy life. Something I never outgrew. Having a strong background of entrepreneurs in my family the message ‘find a way to make a living doing what you love and you will never have to work a day in your life’ was something engrained in me early on. I think I have managed that lesson well. First by becoming an Early Childhood Educator in 1988, a career where I get to spend my days helping to ensure that children get a childhood that is full of magic, wonder and discovery. I have worked from the front line up to administration to now owning my own small home-based early learning program ~ by far the most rewarding part of my journey to date. I have also been asked to speak on several occasions to my peers on the inspiration of work in the early years coming out of Reggio Emilia and how that philosophy of pedagogy and view on children can be applied to our practice here in Canada. I found another way to share my passion for nurturing others when I started sharing my own journey into getting comfortable in my own skin when I finally, after years of basically having ‘given up’, found a skincare line that not only brought some relief to my challenging skin problems but has helped to start healing it. Now I want to ensure that everyone in my life is truly comfortable in their own skin and if they are not to perhaps offer them a solution where they can be again as I never really realized how much of a difference it made to the quality of life when you are not ~ everyone should be comfortable in their own skin. As that struggle for 'life balance and health' continued in my life I kept looking for what was going on causing my body to be out of balance with its innate self ~ I started researching and removing toxins from my environment and looking for natural ways to clean my home and engage in self care and personal hygiene, after getting diagnosed with Celiac in 2005 and spending a decade on a 'traditional gluten free diet' and not getting where I wanted to be I got in touch with my inner cave women and looked for ways to remove toxins and pollutants and preservatives from my families diet and recently have moved to embracing the #GrainFree lifestyle! It has returned to me a love for being in the kitchen and trying new recipes and expanding my palette to include more fresh veggies! 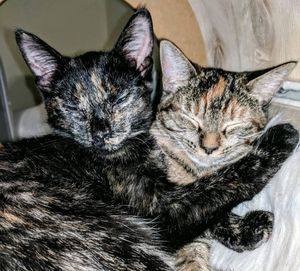 Meet Luna and Lily - our two most recent rescue kitties who joined our home in November 2018. Born on May 10th, 2018 this two beauties stole my heart the first moment they showed up in my feed on Facebook and I knew they were just want we needed to complete our lovely family! They were adopted through the Heavenly Hills Animal Sanctuary in Lucan - if you are ever looking to add to your furry family highly recommend working with Sonia - she has the hugest heart! Occasionally the girls might want to impart their words of wisdom with you all! Meet Nevada ... the amazing cat who saved my life as much as I saved hers. Discovered her on a pot light in front of the Monte Carlo in Las Vegas and she stole my heart filling it with a love I just cannot explain! Like me she is a fighter ~ the vet said she was about two years old when we rescued her and she was just under two pounds but full of spit and vinegar and before we knew it she was a strong healthy kitty and flying home with us to Canada ~ some shock to her system to arrive to a snowstorm. She spent the first few months sleeping on top of either the heater, my laptop or me! 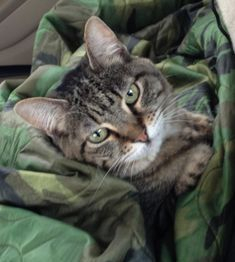 For a feral cat she is very affectionate and prefers the company of humans and she talks A LOT apparently she too has a lot to say about the world and the things she's seen and wants to share it ~ so on occasion she loved be a guest blogger with us here on the blog! Sadly Nevada crossed the rainbow bridge on May 5th 2018 after a battle with cancer - she left the hugest whole in the hearts of all who new here and is greatly missed everyday! Always here for you ~ shoot me a message and I will reply within 1 business day.